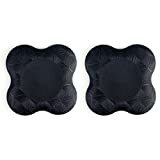 Two yoga knee pads are include. This yoga knee pad is thick enough to surpport and relief pains for hands,knees,elbows,hip,and feet. Made of eco-friendly PU, which makes it easy to clean and will not absorb moisture. Soft to touch. It’s high density and thickness provide cormfort while training balance and stability. This yoga knee pad weights 4.9 Oz, with the size 7.6″×7.6″×20mm. It is convinent to carry.